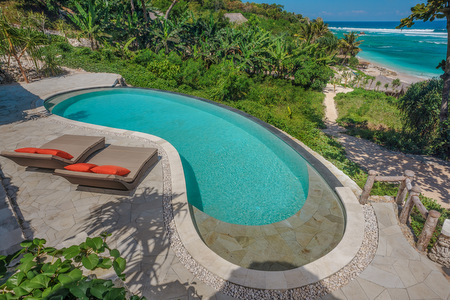 From exhilarating experiences including access to privately surf one of the world’s best left-hand break waves, to world-class sport fishing and diving to the purest shores of our 2.5 kilometre private beach, sunset gazing or star-lit dining; each stay is expertly crafted through a personalized approach shaped by pleasure not design. 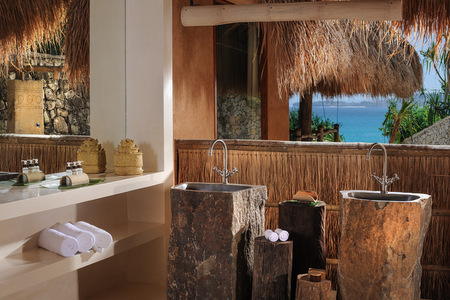 Sumba is part of the Lesser Sunda Islands and its geography spans 11,000 square kilometres, making it twice the size of Bali, with only 650,000 inhabitants (approximately one sixth of Bali) where the majority of the population still follow the ways of their ancestors. The terrain on Sumba is quite different to its neighbouring islands; undulating hills replace the typical volcanic terrain in Indonesia with many areas in the North and East of the island resembling dry savannahs, whilst central highlands are covered in native Alang Alang grass and the mountains in the South extend down into lush tropical vegetation. 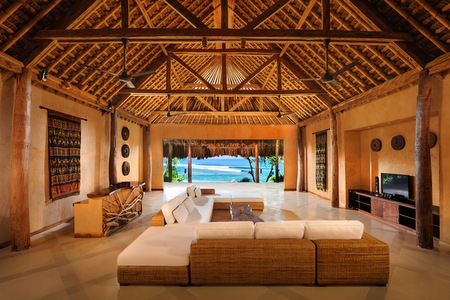 The World Wildlife Fund categorised Sumba as a deciduous forest eco region due to its special flora and fauna. However, only 7% of the island’s forest remains protected and preserved. Laiwangi Wanggameti National Park and Manupeu Tanah Daru National Park were designated in 1988 to protect the nature. Due to the isolated location of the island, the language, religion and traditional lifestyle of the Sumbanese culture has been preserved. Traditional dress is still observed in day to day life; men wear a short sarong (Hinggi) around their hips with belt and sword and a band or turban of woven Ikat with motifs and women wear long sarongs and headbands with different motifs. Traditional villages and settlements are commonplace with traditional houses constructed over three storeys in a wooden structure, high pointed roofs made from native Alang Alang grass and sides of plaited bamboo. The construction of a house is accompanied by rituals and is believed to be a social and ceremonial unit. Throughout the year the island is the site of many fascinating rituals; the most spectacular of them all are the Pasola ceremonies that take place during the months of February and March at select locations along the west coast. 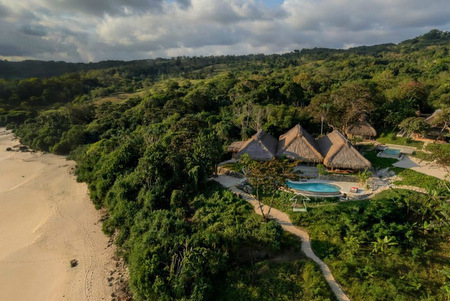 Stretching across 560 acres of unspoiled natural land including a two and half-kilometer private beach, this spectacular all-villa resort offers secluded privacy and the ultimate exclusivity. 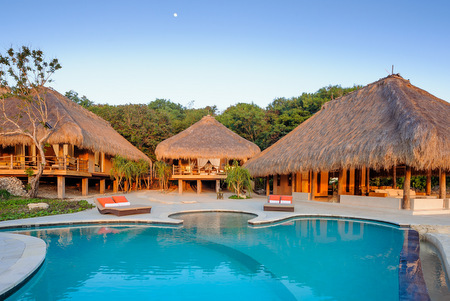 The 21 villas of exceptional design are built on private terraces with large verandahs that sift through the trees with an impressive use of living space, imbued by natural materials to make the most of the dramatic views. 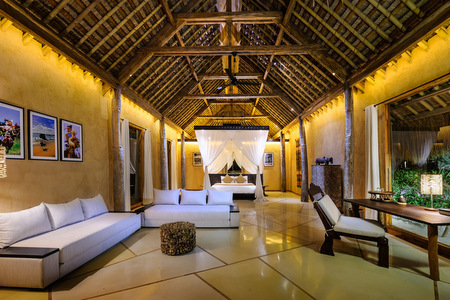 Guest facilities include the iconic Boathouse, Ombak restaurant, Nio Beach Club, Menara Bale, private dining pavilions and the Beach Spa. 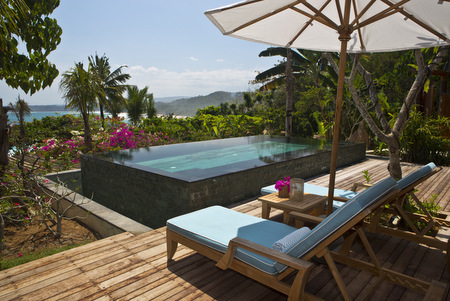 Tucked amongst the trees are Nihiwatu’s 21 villas that represent the cutting-edge of responsible luxury. 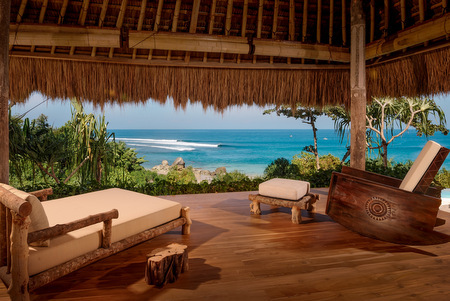 Perched above the Indian Ocean and hand-built by local craftsmen using materials indigenous to Indonesia, like Alang Alang, teak and rattan, all the villas are air-conditioned with panoramic views. 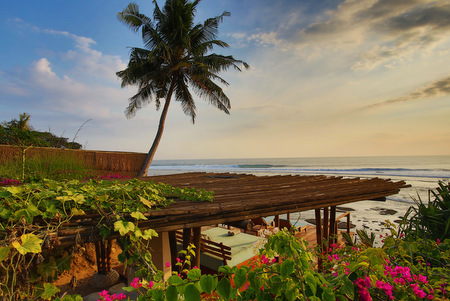 Dramatically positioned with sweeping views of the sea, surf and spectacular sunsets, the Boathouse is an iconic destination and bar at the heart of the Nihiwatu experience. 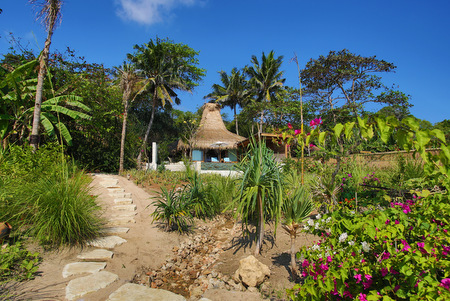 By day, it acts as an outpost to adventure whilst the nightly ritual of lighting the fire on the beach ceaselessly brings a quiet symphony to the landscape; creation, life and inspiration are topics of daily parlance.